RCA Cables are very similar to their Instrument Cable counterparts. They are unbalanced, similar to TS instrument cables, and can accomplish the same goals only with a slightly different connector type. You might recognize these as the older style audio component cables for your stereo, and you may already have several laying around the house. 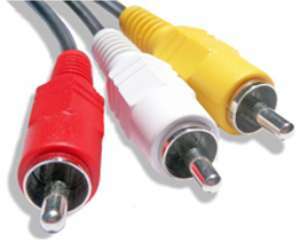 These are traditionally used for connecting your camcorder, video game system, or even VCR (for our more mature visitors out there) to your television. The usually have the Red, White, and Yellow color scheme shown below corresponding to left audio, right audio, and video respectively. If you're like me then you probably have a "miscellaneous drawer" somewhere in your house. And furthermore if you're like me then you have no idea what's in this drawer. It could be anything from an original Picasso sketch, the Declaration of Independence, or maybe even.... some shiny, almost never used RCA cables. There is no reason not to use these... and with the help of a instrument cable to RCA adapter, you could use this type of cable all over your home studio setup. Anyway, getting older, second hand gear off Craigslist or eBay is a great way to go, and the older the equipment the more likely you are to have RCA inputs and outputs. For the cable lengths you'll be using for your home setup, you don't have to worry about losses through these either. Just be aware that newer gear will most likely not have these, but it's okay since they are almost identical to instrument cables. Especially if you're still deciding whether or not you really want to pursue this hobby, I believe it's always best to leverage off what you already have and check out used gear before getting into new stuff. And like I mentioned above older stuff will probably have these connection types on them somewhere. Give these cables a chance, they're here to help you bring your music to the world.